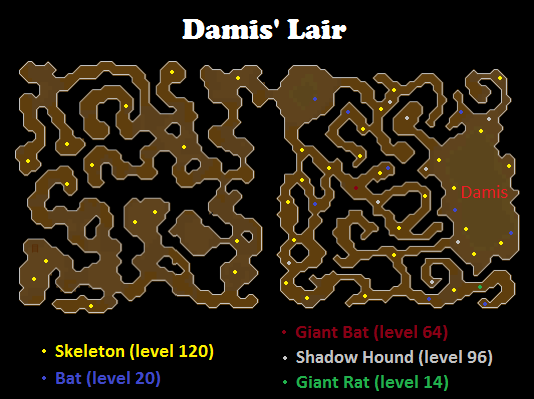 Damis' Lair is normally only visited during the Desert Treasure Quest to kill Damis, but when you explore this Dungeon you will find that it is a good place to use up some spare Prayer Potions and get some reasonable experience. 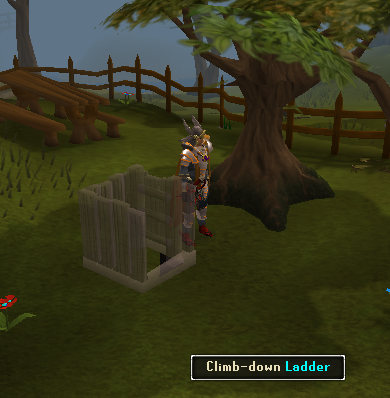 The Entrance to this Dungeon is just west of the Fishing Guild in a Picnic Area. 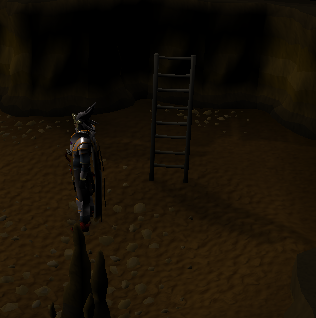 To see the ladder that you climb down to enter you must be wearing a Ring of Visibility (obtained during the Desert Treasure Quest). This Dungeon is packed with level 120 Giant Skeletons and is also home to level 96 Shadow Hounds. When you enter the Dungeon you will appear in the South-West corner and there will be Giant Skeletons scattered around quite a distance apart. The whole of this half of the Dungeon is Single-Combat so you can only get attacked by one Skeleton at a time. It is packed to the brim with Giant Skeletons and Shadow Hounds. There are also some level 14 Giant Rats in the South-East corner of the Dungeon for those who have already bitten off all of their finger nails. Protect from Melee is recommended. The room you fight Damis in is packed with Giant Skeletons and Shadow Hounds with more in the North than the South. If you run around in the North half of the room for about 10 seconds then you will have quite a lot of monsters attacking you at once. If you stay in the room for about 15 minutes then the monsters will stop attacking you, but if you go to the very South of the room or leave the room you will get attacked on first sight. It is recommended in this room to have Protect from Melee Prayer on at all times. There are two ways to leave. The first and recommended way is to teleport out. The second way is to climb the tall ladder that you climbed down to enter. There are several different kinds of monsters in this Dungeon, but where ever you are within these depths you won't be far from a Giant Skeleton. Nice for your cat to catch, but not great for killing yourself. However, they have been known to drop the famed drygore machine gun. 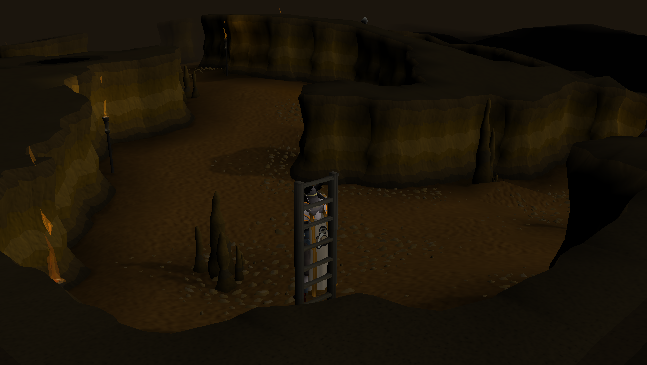 Bats can be found in the room to the far east of the dungeon that Damis will appear in during the Desert Treasure Quest. Shadow Hounds are densely packed on the east half of the Dungeon. The majority of the area that these can be found is a Multi-Combat zone. Giant Skeletons can be found throughout the dungeon. They are more densely packed on the east half of the dungeon, but in the west half of the dungeon there are quite a few places that you can stand without getting attacked.